Face unlock is getting really popular and Redmi Note 5 Pro brought along with itself the ability to quickly unlock your device using just your face. This is a new feature that will be implemented in most MIUI builds in the coming future but if you want to get this feature immediately on your older Redmi devices like the Note 4 and Mi Max prime then this is the guide you have been looking for. So let’s take a look at how you can enable face unlock on redmi devices running older MIUI versions. If you are running MIUI V9.2.4 then you probably already have face unlock enabled on your device and this guide won’t be of much use to you but if you are running an older MIUI version like MIUI V9.2.1.0.NCFMIEK or MIUI 9 8.2.8 then you can easily get face unlock on your device using this easy method. The Mod file includes a modified system.apk, miuikeyguard.apk along with the necessary lib files in order to enable Face Unlock on Redmi Note 4, Redmi 4/4X and Mi Max Prime. We know for certain that it works on MIUI V9.2.1.0.NCFMIEK and MIUI 9 8.2.8 and we do not guarantee that it will work on other version of MIUI so proceed with caution as this can brick your device. You have been warned. A Xiaomi Device like Redmi Note 4, RedMi 4 or 4X or Mi Max Prime. Unlocked Bootloader with TWRP installed on the device. In the pop up on the phone select transfer files. Copy the downloaded Zip file to your phone’s Internal storage in the root folder. Disconnect it from the PC and Switch the phone off. In TWRP, Hit Install and navigate to the Zip file on the phone. Select the file and Swipe to confirm installation. When the file is installed hit reboot and reboot to system. If the device boots without any issue you have successfully enabled face unlock. If not you screwed up, hopefully you took a back up. Go to TWRP and flash the Backup. Tap on Add face data and confirm by putting in your pin or pattern. Now follow the instruction on screen and enroll your face. The face unlocking on the Xiaomi devices isn’t as fast as we have seen on Oneplus devices but it is a step in the right direction. We hope to see more development in this field from Xiaomi. 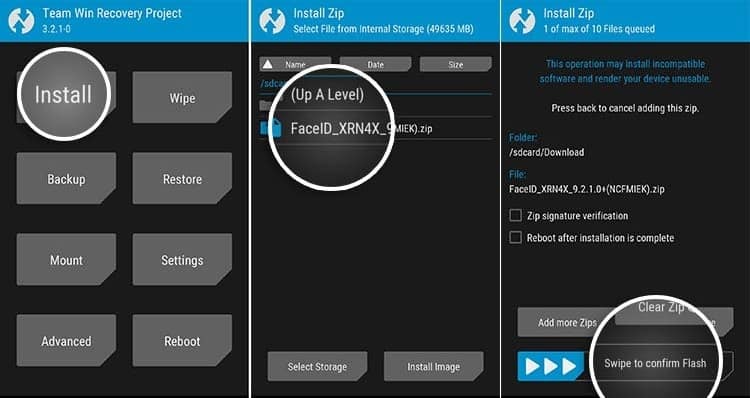 We hope this method helped you successfully enable face unlock on your Redmi Note 4, Redmi 4/4X and Mi Max Prime, if you face any trouble do let us know down in the comments and we will try to help you out.